On Thursday, Sept 19 I was driving Little Prince to daycare (and then me to work). The traffic on the highway was stop and go. I was stopped. The person in the truck behind me didn't stop. He hit me so hard it pushed me into the person in front of me and the person in front of me was pushed into the person in front of him. Thankfully Little Prince only had a few scratches (so thankful we are still rear-facing and have an amazing Diono Raidan RXT). 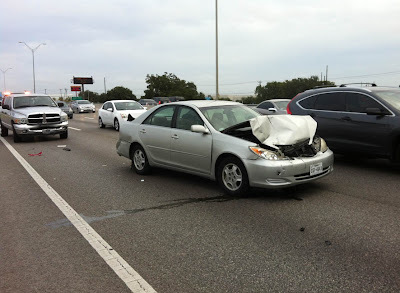 I came out of the collision with some bruising, a hurt head, and whiplash. 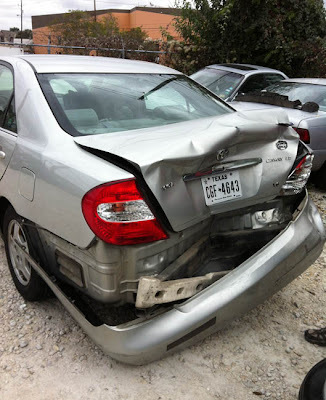 My car, Baby, did not fair so well. Little Prince and I got to ride in an ambulance to the hospital and lordaerith met us there. The doctor at the hospital said I was just banged up and would be sore the next day and recommend acupuncture and chiropractic care. So we took LP to daycare, dropped off prescription for happy pills, found out where Baby was towed to and cleaned everything out of her and sad good-bye as we were pretty sure we’d never see her again. And we were right. 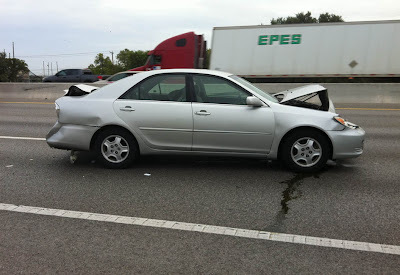 The insurance company declared her totaled the following Tuesday (Sept 24). Good-bye Baby. When we bought you in 2004, my mother said you’d be the car I’d bring my children home in, and you were. You saw us through a wedding, a cross-country move, and multiple daytrips and road trips. You use to let me dress you up like a reindeer around Christmas time. 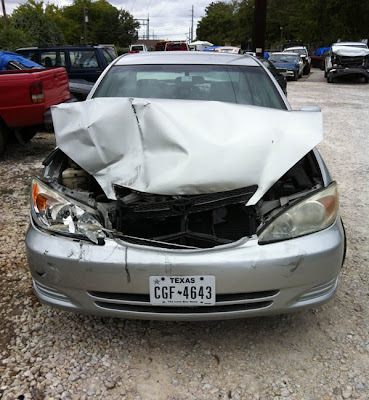 You survived being hit by a deer, being lightly rear-ended a few times, and you only let me get pulled over one time. You use to make a whoop sound when the A/C was on (until Aerith fixed that) and you were starting to squeak at times. And remember, no one parks Baby in a corner. In the meantime Aerith was working really hard to find us a new car and to position ourselves to buy it (with some help from family and an awesome rate from the awesome UMassFive College FCU, which is yet another reason why we still bank with them even though we moved out of state). 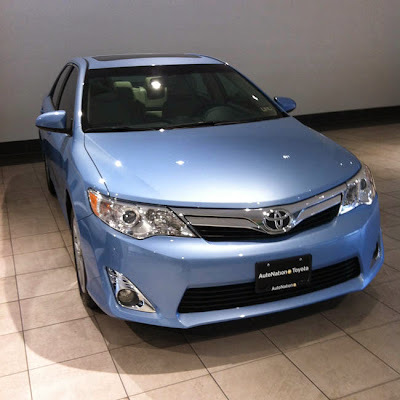 On Saturday, Sept 28, my birthday, we went back to the Toyota place to put down the deposit on the car we liked. Little did we know they’d let her take us home that day. I love love love her. She’s my third Camry (I've only had Camrys), but my first four cylinder (Audrey and Baby with both sixes) and the first brand new car I've ever owned. She’s awesome. She is totally tricked out (moon/sun roof, keyless ignition, heated seats, dual climate control, etc), drives like a dream, and integrates with our phones (no more tape deck adapter for me!). We’ve already taken her on her first daytrip (to Sea World). I finally had to fill her up last night after putting almost 400 miles on her. The only thing that bugs me is that my super large water bottle doesn't fit in her cup holders, but I have a smaller water bottle that does, so it's not so bad. And I already put my New Orleans Saints Fleur-des-lis magnet on her.